I absolutely love shopping in all shapes and forms, but the recent push to support small businesses owners and “shop small” has really put a smile on my face. As a small business owner myself, I jump at the chance to give back and shine a light on some true superstars. Over the years since I first started blogging, I’ve had the privilege of getting to know the pet industry inside and out. Part of that wonderful experience has led me to meeting fellow bloggers and small business owners focusing on making life better for pets and their people. Today’s Stocking Stuffer Giveaway features three amazing woman who inspire me daily. 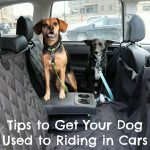 They not only run fantastic dog blogs you should definitely check out, but they also run separate pet related businesses. Please visit and thank Brooklyn Bowtied, Club-Doggie, and the Inspired Closet for sponsoring Day 3 of the 2018 Stocking Stuffer Giveaways. Don’t forget to check out the event page to ensure you enter all 10 days of giveaways! Disclaimer: Brooklyn Bowtied, Club-Doggie, and Inspired Closet provided product or service free to review. I received no other compensation or additional benefits for mentioning the brands or products in this post. The opinions and ideas in this post are my own and are uninfluenced by any other person or business. Brooklyn Bowtied, Club-Doggie, and Inspired Closet are responsible for all giveaway prizes including shipping. 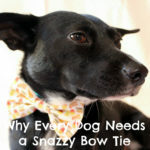 On top of that Rochelle runs a successful Etsy shop selling some pretty snazzy bow ties designed specifically for dogs. Ralph has acquired a few over the years and they are definite favorites. He’s never looked so suave in his whole life. 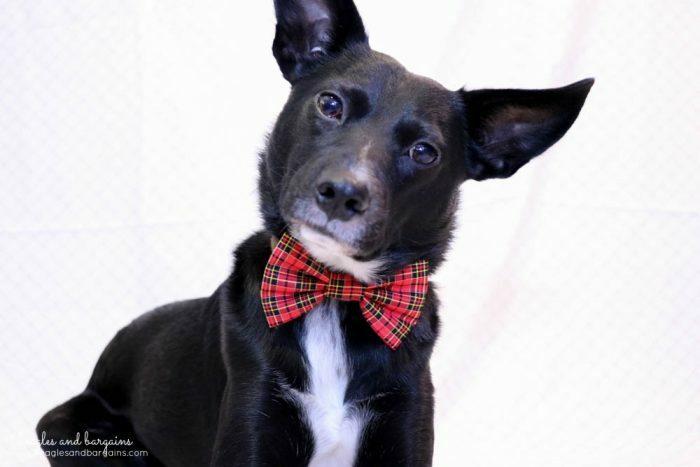 If you need more convincing, you can also check out our post from last year on Why Every Dog Needs a Snazzy Bow Tie. For the holidays, there are 5 new bow tie patterns available at Brooklyn Bowtied. My personal favorites are The Blackstone and The Conifer, but you can also choose from The Emeline, The Elmgrove, and The Ives. PLUS, there are a ton of all season bow ties available like my current favorite – The Bijou, which is covered in sprinkles and PERFECT for any birthday celebration. If you’re loving Brooklyn Bowtied as much as I do, be sure to get your order in ASAP because the last day to order for 2018 is December 10. Save 20% off full-priced dog bow ties with coupon code SANTARALPH NOW through 12/10! If you want to learn more about Brooklyn Bowtied, be sure to follow Rochelle & her pup Henry on Facebook, Twitter, and Instagram! Don’t forget to check out the Brooklyn Bowtied Etsy Shop too. Kama is one of two wonderful women behind Club-Doggie (the other is her mom, Jubie). I’m constantly amazed at how determined, positive, energetic, and successful Kama is in all the facets of her life. I honestly can’t even keep track of how many projects or dogs Kama has at any given time. (She has a lot of dogs). But all those dogs and projects have given her a ton of valuable experience that make her absolutely spectacular. On top of running two blogs – Kama Loves Agility and ChiPets, Kama is a dog trainer for tricks, agility, and even puppies. She’s been competing in agility, training dogs in all shapes and sizes, and even running an animal talent agency. Recently Kama has also launched, Club-Doggie ONLINE to share her and Jubie’s knowledge of dog training outside of their home state of Arizona. Currently Club-Doggie ONLINE has two courses, Puppy and Agility, with the plans to add Tricks and more in the near future. 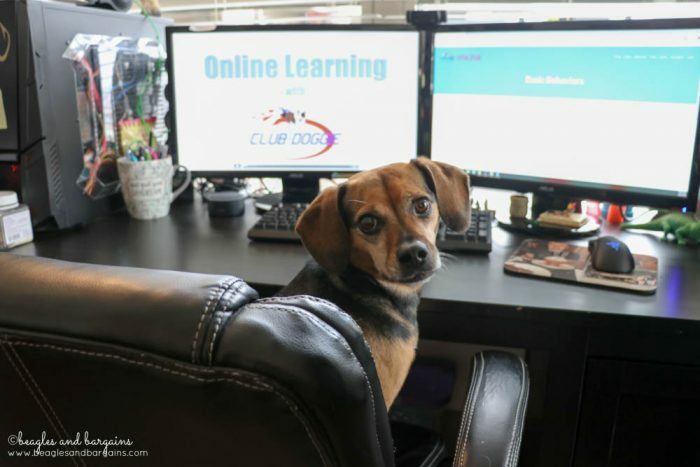 If you’re interested in learning more about dog training, I highly recommend checking out Club-Doggie ONLINE. 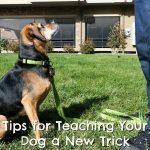 Kama is and will always be one of my go to experts for dog training questions. If you want to learn more about Club-Doggie, be sure to follow them on Facebook and Instagram! Don’t forget to check out Club-Doggie ONLINE too. Christina is the mastermind behind the Inspired Closet and she is a true inspiration to me! I’ve been watching her grow her blog, The Everyday Dog Mom, and now her Etsy Shop for quite some time. I’m always amazed at the level of creativity and expertise she demonstrates in both of these ventures. 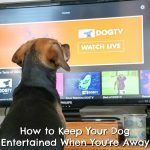 If you’re a proud Dog Mom, be sure to visit her blog as it’s a great resource and place to celebrate our love of dogs. If you embrace the Dog Mom title, you should also run, not walk, to the Inspired Closet Etsy Shop. Seriously there are so many cute things for sale that you might actually want them ALL. 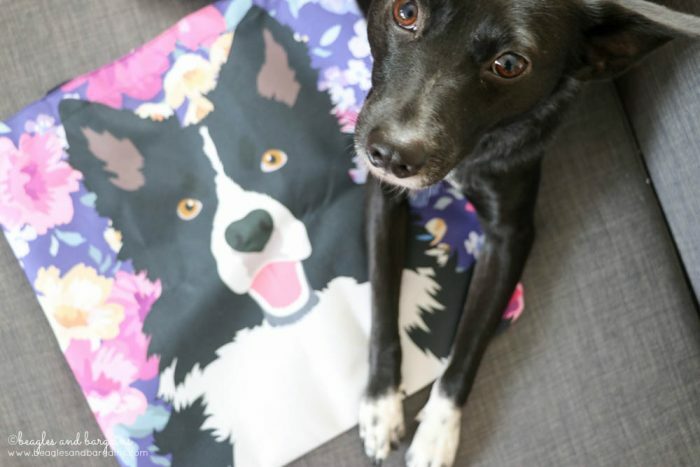 Be sure to check out her adorable selection of leggings, many of which feature adorable artwork of dogs, and don’t forget to get a matching t-shirt to complete the outfit. 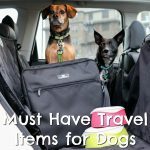 The Inspired Closet is an all around great place to search for gifts for your favorite dog mom (you know Christmas is coming, right?) 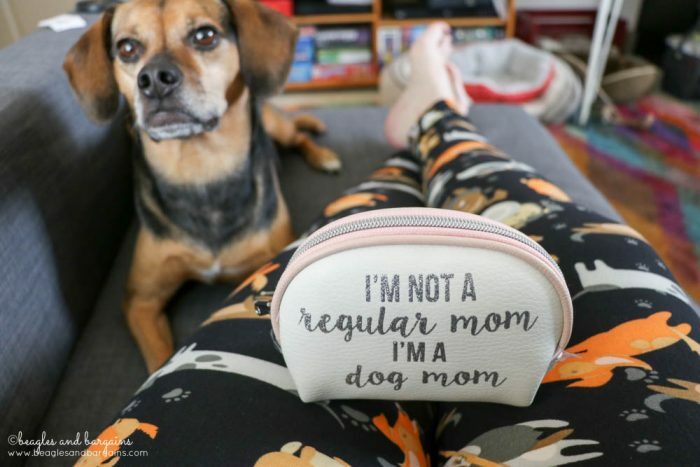 and there’s no shame in your favorite dog mom being yourself! In addition to the leggings and t-shirts, you can shop for bags, jewelry, and kitchen decor. Act fast because you have through December 14 to get guaranteed delivery in time for Christmas. If you want to learn more about Inspired Closet, be sure to follow them on Facebook, Twitter, and Instagram! Don’t forget to check out the Inspired Closet Etsy Shop too. 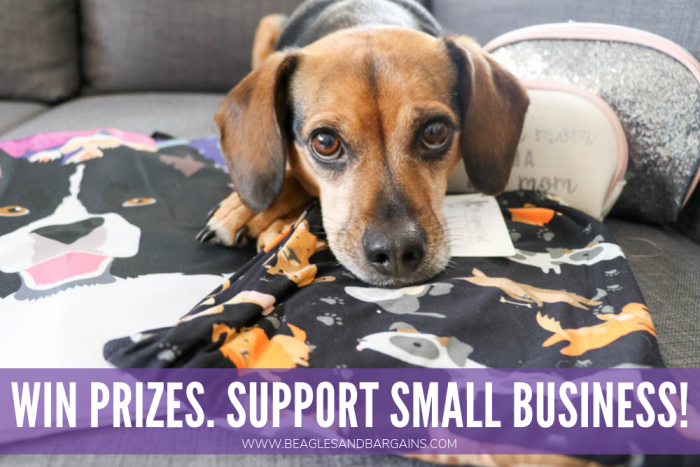 FIVE lucky Beagles & Bargains readers will receive prizes from Brooklyn Bowtied, Club-Doggie, or Inspired Closet! Residents of the United States are eligible to enter via the Rafflecopter below. Entries must be submitted by 11:59 PM EST on Saturday, December 22, 2018. Winners will be notified via email within 48 hours of the giveaway closing and will have 48 hours to respond and claim their prize. One (1) winner will be randomly selected to receive three (3) Dog Bow Ties from Brooklyn Bowtied in the pattern of choice pending availability. Approximate retail value is $54. Two (2) winners will be randomly selected to receive one (1) month access to Club-Doggie ONLINE Puppy Training Program. Approximate retail value is $75. Two (2) winners will be randomly selected to receive one (1) $25 shop credit to Inspired Closet Shop. Approximate retail value is $25. And don’t miss any of the 10 Stocking Stuffer Giveaways! 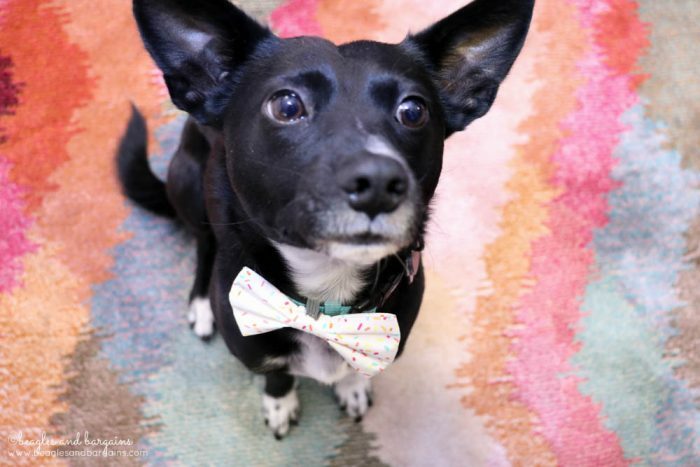 What Brooklyn Bowtied bow tie would your dog look best in? 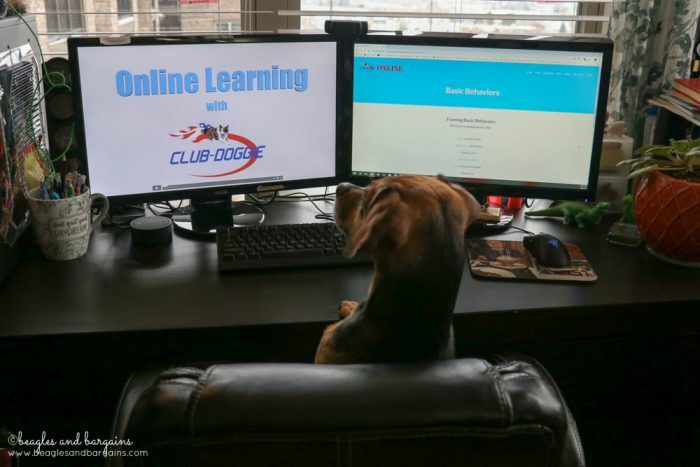 What’s one thing you’d hope to learn from the Club-Doggie ONLINE Puppy Training Program? What’s your favorite item currently in the Inspired Closet Shop? Want to save these great businesses for later? Save this post by pinning the image below on Pinterest!